Case Study – What’s Wrong with Timothy? The endocrine system can be a difficult subject to cover in anatomy. It isn’t as showy as the other systems where you can label organs or dissect an eyeball. Students must also memorize a number of hormones and their functions which have complicated names like thyroxine and tri-iodothyronine. When I first started teaching anatomy, I dreaded this chapter. Now, I actually like it because I have been able to incorporate real world examples of how important this system is. 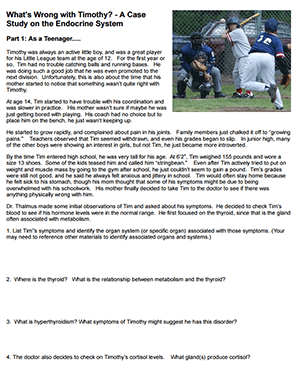 I’ve also added a case study where students learn about a boy who was diagnosed with a thyroid disorder. Students work in groups to follow Timothy, learn about hormones and what happens when hormone levels are not normal. In addition, feedback loops are discussed where students examine a diagram of the pituitary, hypothalamus and thyroid to determine where the loop is broken and how hormone therapy can help Timothy maintain homeostasis. I also have presentation slides to go with this chapter, and no longer use the book. My presentation focuses on real-life examples of control by the pituitary gland. My dog was diagnosed with Cushing’s disease and diabetes, and has provided a starting point for discussions about the endocrine system. Thanks! I inherited this anatomy class a few years ago, I’ve been trying to add more engaging activities so that the whole class isn’t just lecture-based.